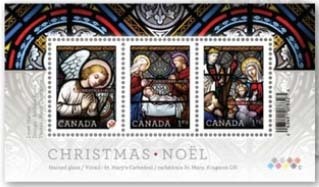 On November 1st, 2011, Canada Post began issuing three new stamps as part of its Christmas 2011 series. This year’s theme for the new stamps is ‘Stained Glass’. The craft of colouring glass goes back to ancient times. In ancient Egypt, colouring glass was used to make beads and jewelery, as well as ornamental and decorative pieces. The ancient Romans are also known to have manufactured coloured glass; some of these artifacts can still be viewed in various museums. Of course, stained glass has been commonly used to embellish large windows in churches and cathedrals since medieval times. Early stained glass was made by adding salts or metals to the glass during the manufacturing process. Depending on the additive, different colours could be achieved during the firing of the glass. The glass was then cut to the right shape and all of the small bits arranged together in a design. The bits were then held in place within a frame with lead strips. With time, the technique and colours were improved, some even began painting the glass before firing it. The subject matter of stained glass windows was often Bible stories or traditional stories of the saints of the church. In fact, the expression ‘Poor man’s Bible’ is used to describe a large window, or a series of windows, whose stained glass pictures portray a narrative of the Bible in illustrative form. This was especially useful for the illiterate who could not read the Bible, or for those who did not have access to one. The stained glass illustration on this month’s stamps depicts a highlight from a window in the Cathedral of Saint Mary of the Immaculate Conception in Kingston, ON.